Innovation and R&D help fastener manufacturers keep pace with new building materials, installer preferences, and shifting housing trends. THINK FASTENERS ARE JUST A COMMODITY? THINK AGAIN. Manufacturers continue to innovate, and many fasteners offer an array of unique features that address the latest building trends, the newest materials, and, of course, ever-changing codes. 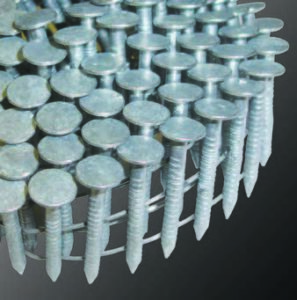 Savvy dealers who can appreciate and understand what makes different nails and screws unique can stand out from competitors while helping their customers build better and faster. In fact, with so many fasteners on the market, it’s more essential than ever for dealers to understand the products they offer and to communicate which are best suited for each application. Indeed, decking is a prime example. An installer’s choice in fastener can have a big impact on the aesthetics of the finished surface. 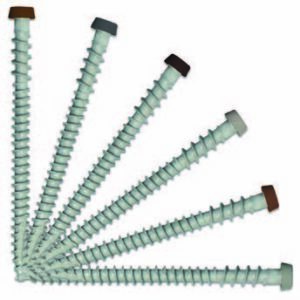 The proliferation of capstock decking products a few years ago, for instance, called for screws that reduce mushrooming— but not necessarily the mushroom-reducing screws that are popular with traditional composites; for best results, follow recommendations from the manufacturers you represent. The need carries across all types of materials, and manufacturers are continually innovating to keep up with what’s new. One material that continues to require attention is pressure-treated lumber. As many dealers may remember, when CCA treatments were phased out in the mid-2000s, some of the replacement treatments, such as ACQ, tended to be more corrosive, and fastener manufacturers had to adjust their coatings. New treatments continue to emerge, and it’s important for dealers to understand which fasteners are best suited for and can be used with each new product as they bring them on board. For exterior applications in coastal areas, stainless steel is still the go-to— and for the most part required—fastener to avoid corrosion from salt spray. “Architects, specifiers, builders, and even homeowners are increasingly requiring the use of Grade 316 stainless steel fasteners in coastal areas (and other environments where corrosion is a concern),” says Crossley. 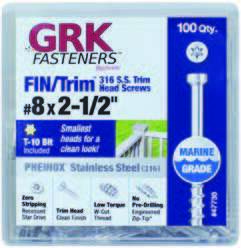 “While we’ve always recommended the use of Grade 316 stainless, the level of knowledge in the field concerning stainless steel fasteners has really increased dramatically in the past several years.” In June GRK launched a 316 stainless steel structural screw for decking that meets the most stringent building code requirements. The low-torque tip design is easier on both the user and the equipment. 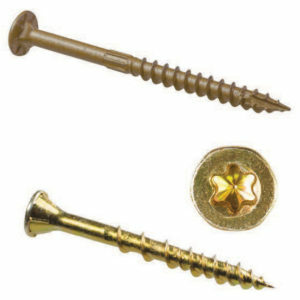 Among the Strong-Tie fasteners featuring it are the new SDWS Framing Screws. 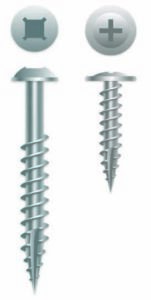 The load-rated screw can be used for a range of applications. 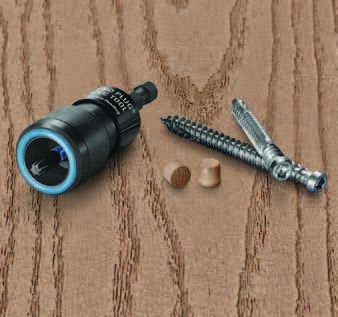 Increasing versatility is resonating with remodelers, handymen, and DIYers who want a load-rated screw they can use for more tasks. Many remodelers also are switching to using impact drivers, which are small, light, and fast. All of this innovation means greater efficiency and, ultimately, better homes, even if it means a higher upfront price tag. “Even if you pay a little more for full-featured fasteners, you’re going to save money in the long run due to lower installed cost,” Allen says. Winchester says Intercorp is also seeing requests for longer screws that accommodate heavier-duty materials and energy-efficient construction. The company is applying that same performance to other areas of the hardwood deck with new products such as WiseWrap JoistTape and LedgerTape, a bitumen joist flashing tape that protects against moisture and rot, and a hardwood deck restoration kit. “We’re really looking at trying to capture every kind of deck building need someone might want to use for a hardwood deck,” Kabel says. For the kitchen, GRK recently introduced a line of cabinet screws powder- coated with white to meet current trends for white cabinetry. 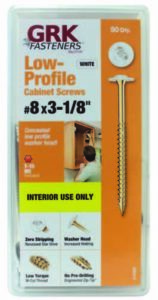 The screws also blend into interiors for use with popular glass-front cabinets. With the sheer number of fastener options available, it’s essential for dealer sales teams to stay knowledgeable about what they carry. Familiarity is key to moving fasteners beyond a commodity and an afterthought into a mentality in which they play an integral role in a safe and beautifully finished home. This includes understanding what fasteners pair best with materials, including wood framing, cabinetry, roofing, drywall, and decking. Failing to do so could lead to callbacks, voided warranties, and product failures. 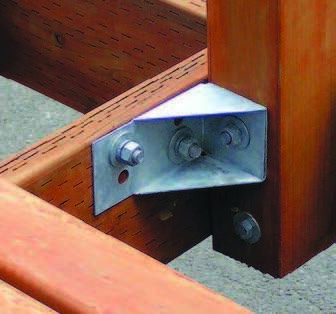 “It is important for dealers to recognize that fasteners are an integral component of any building system, and choosing the right fastener is critical to ensure the quality and longevity of any project,” says Crossley. “[Dealers] can really help their customers by being informed about changes and new applications for fastening,” says Winchester. “[Provide] the customer with choices and knowledge so they can make an informed purchase on the right product for the job. Changes are happening fast; sometimes builders and contractors don’t have the information on the latest fastening solutions. Winchester says Intercorp continues to increase its marketing budget to drive sales of products to the end user and contractor, and they facilitate introductions with distributors that carry their brand. Starborn recently launched its own program to provide in-store demonstrations at key dealer outlets. Along with an extensive array of training materials and resources, Simpson Strong-Tie launched a screw substitution calculator that provides Strong-Tie alternatives to NDS fasteners. The company also has made its packaging user-friendly, including pictures of applications and load data. “It gives the user all they need to know on the package,” Allen says. In addition, Allen adds, end users are looking for more convenient packaging— they don’t want to have to buy a bucket for a small job. In response, Strong-Tie has started individually flagging structural fasteners. Shifts such as this are indicative of a larger effort on the part of manufacturers to stay up on trends so that they’re ready with the right fastener to meet any changing need or requirement. For example, Starborn has seen growing demand for rooftop decks in urban areas. 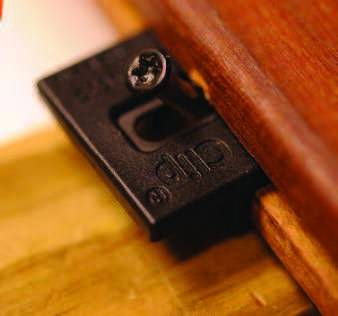 “Rooftop decks require unique fastening methods, so we’ve responded by developing fasteners specifically for use with PVC, composite, and hardwood decking installed on rooftop sleeper systems,” says Crossley.